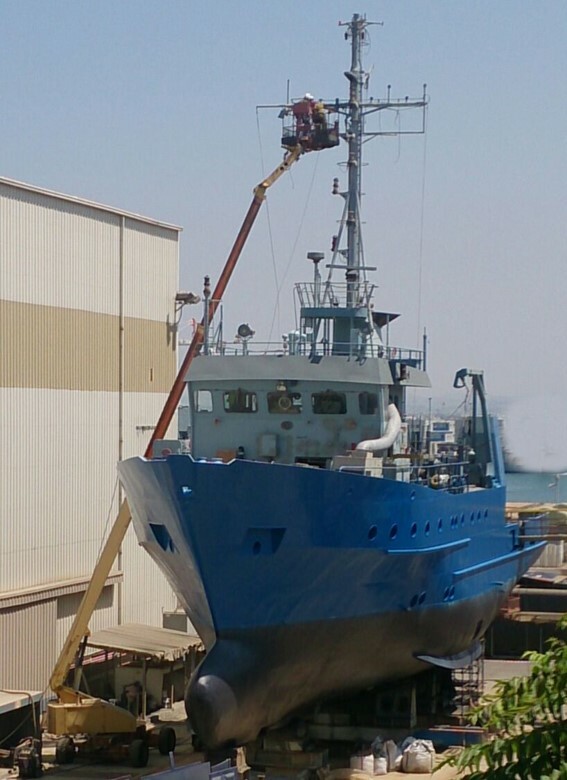 IOLR’s new research vessel R/V Bat Galim returned to the water in October 2015 after being worked on in dry dock in the Israeli Navy’s Haifa yard for nearly two years. R/V Bat Galim will replace IOLR’s R/V Shikmona, IOLR’s current “blue water” research vessel which has been in use since 1982. The Shikmona, a 52 year old commercial tender acquired from the US DEA, was sailed to Israel by IOLR founder Admiral Yochai Ben Nun and his crew. R/V Shikmona provided great service, but it’s time for a new(er) ship. The Israel Ministry of Energy and Water Resources agreed and provided funding to acquire the surplus naval vessel I/S Bat Galim from the IDF Navy. The Bat Galim is a utility tender originally built in Germany for the German Navy in 1989 and later acquired by Israel. It is a steel hulled ship displacing 400 tons, it measures 126 feet long by 30 feet wide, and drafts 10 feet of water depth. It is powered by diesel engines making 1,210 horsepower, with a top speed of 12.5 knots. Its range is 1,000 nautical miles carrying 18 tons of fuel, and it has room for 24 people (6 crew, 18 scientists/technicians). The vessel is very well built and in excellent condition, with fuel efficient engines. The ship is acoustically quiet, which makes it a good platform for sonic instrumentation. Other great features for a research vessel are a Becker flap rudder to improve low-speed maneuvering and a transom stern that can accommodate equipment containers. To convert Bat Galim from a naval vessel to a research ship, IOLR’s retrofit started in 2014 and is expected to finish this summer 2016. Under the direction of Dr. Gideon Tibor, Marine Geophysicist at IOLR-NIO Haifa, the Bat Galim underwent extensive upgrading to make it a cutting-edge oceanographic research vessel with advanced instrumentation and capabilities. Major upgrades included modifying its keel with an instrument “bell” to house a variety of sonic measurement transducers (multi-beam sonar; ADCP-Acoustic Doppler Current Profiler; USBL-underwater acoustic positioning; echo sounder). Propulsion and navigation systems were modified to include water jets that can position the vessel consistently on station via dynamic positioning. The aft deck received a 23 foot-high A-frame structure that supports a crane to launch heavy objects, including measurement equipment, ROVs, UAVs, etc. The aft deck was also modified to carry two replaceable container modules which enclose laboratories that can be swapped as needed. The vessel will be able to do geophysical surveys, high resolution bathymetry, coring, trawl towing and large sampling, operating in deep water with onboard experimental and analytical resources. It will be the most capable deep ocean research vessel in Israel and the most advanced in the Eastern Mediterranean. It will enable IOLR to do better research in oceanography, especially in the deep sea. R/V Bat Galim helps usher in a new era for IOLR-NIO. There are new responsibilities to meet as Israel ventures further offshore into the Eastern Med to develop its marine natural resources (including gas reserves). 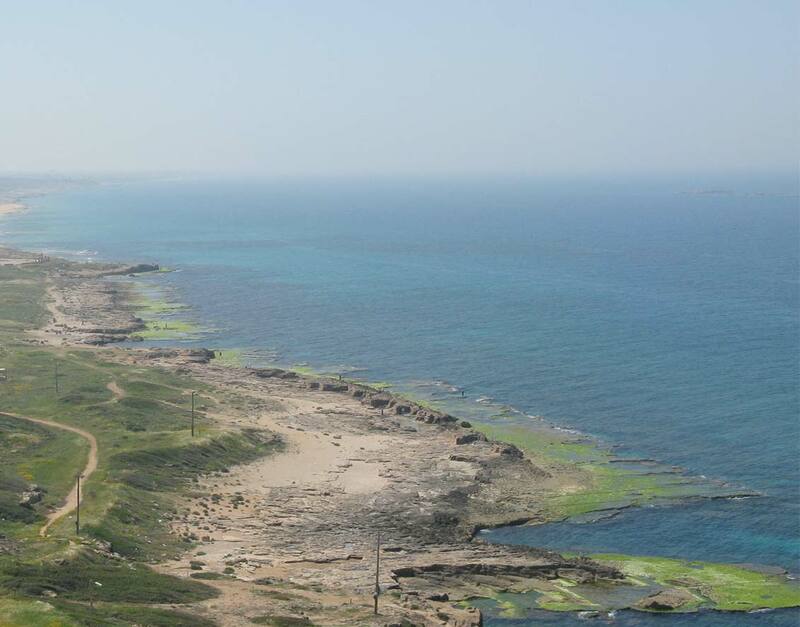 With the new capabilities for “blue water” oceanography that Bat Galim provides, IOLR will become a stronger partner for its European and Med Rim counterparts in studying, monitoring and protecting the health of the Mediterranean Sea.